My mom and sister just got back from a 10 day trip to Paris and Normandy, France. To say I was ridiculously jealous is a HUGE understatement. I have never been out of the country, but I took french in high school and love the thought of traveling there someday. I just have this great desire to be more learned about the world. To completely immerse myself in another culture would be so dreamy. I would love the language, the scenery, the architecture, the fashion, and the art. Oh how I wish I could have gone to Paris with my mom and sis! Unfortunately, now is just not the time in my life for traveling. I have children to rear and I am SO happy for that. I love being a mom and raising a little one(s), but I still look forward to a few years down the road when they don't need me so much and I can run off to a foreign land for a few days! Until then, I can just enjoy the fun gifts that come my way when my loved ones return from their journeys. 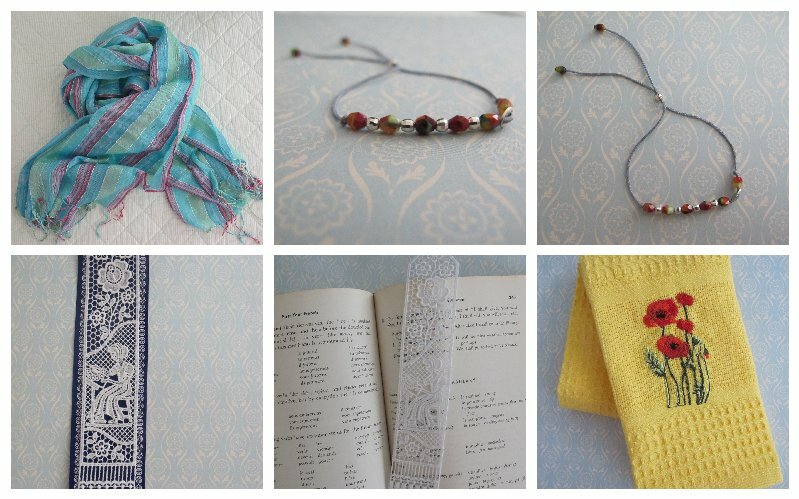 I can just pretend I'm french with my scarf, my dainty beaded bracelet, my crocheted bookmark, and my one of a kind hand stitched towel. Where do you dream of traveling? Or where is your favorite place to travel? I'd love to know!